Salsa Fresca, originally uploaded by jen d. cox. The tomatoes are ripe. Time to make salsa! My recipe calls for Romas, which I did use, but I also used a few other varities, too–Sweet Cluster (really like this one in the salsa), Champion plus a couple tomatoes from my neighbor (Pink & Early Girl, I believe). I also added half of a Serrano pepper to this batch. If you’re not sure how much pepper to use, add it gradually. 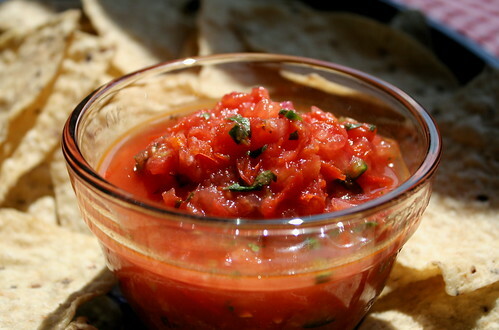 One final note, if the salsa seems like it needs a little something else, it probably just needs a little more salt. Seems like I always end up adding another ½ tsp. or so. Before you get started, go buy a box of rubber gloves from the drug store! Dice the jalapeños bare-handed at your own risk–you will get burned. Drinking a glass of milk seems to help. Other burn remedies include rinsing your hands with rubbing alcohol and applyling a baking soda paste. Chop tomatoes. Strain as much of the liquid as possible off of the tomatoes. Mix all ingredients. Blend about half the salsa in the blender then stir together again with the rest of the salsa (this makes the overal texture a little smoother). Refrigerate 2 hours or overnight before serving (if you can wait that long). Serve with good tortilla chips.